Malone’s latest novel sees the return of Kenny O’Neill, the villain with a conscience. This time we meet his cousin Ian who becomes involved in the vicious and deadly world of the underground fight scene. 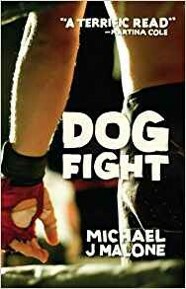 In an effort to save his friend Dom Hastie, a fellow ex-squaddie, sadly handicapped from injuries received while serving, Ian is dragged into the world of illegal fights where there can only be one winner, or indeed, only one survivor. When Ian falls off the radar, it’s down to Kenny to infiltrate the gang that is organising the fights to find his cousin. But he is going to become involved with some very unsavoury characters and you have to wonder if he will come out of this alive. It’s a tough read about a world that is undoubtedly alien to the majority of its readers. Many of the characters are damaged, neglected or plain evil. Criminal overlord Gallagher, who rules his Glasgow territory with an iron fist is as bad as one can imagine but his grandson is even worse. Kenny is going to have his work cut out to help his cousin without finding himself deep in trouble as he has to form an alliance with these dangerous people. For those who like their fiction fast and violent.